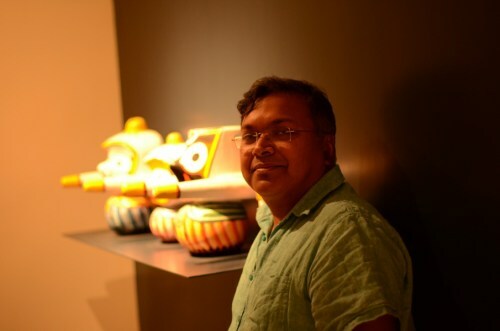 [Here is a longer version of a profile-interview I did of mythologist Devdutt Pattanaik for Open magazine. I admire a lot of Pattanaik’s work, but I also feel there are a few blind spots - including the disproportionate amount of scorn he directs at atheists and “secularists” - and have tried to mention them in this piece. Along with a brief account of a phone conversation where he lost his temper at me. 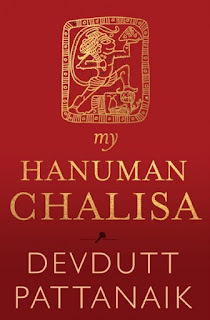 Early in his new book My Hanuman Chalisa – a verse-by-verse discussion of one of Hinduism’s most popular devotional hymns – mythologist Devdutt Pattanaik offers an insight about “north” and “south” in the Ramayana. These are not literal references to north and south India, he says, but metaphors that reflect attitudes or states of mind: the north is an empathetic, caring world while the south stands for fear, insecurity and covetousness. And in between them “is the land of the monkeys, our animal core, that can move either way, towards Rama or towards Ravana”. Hanuman, he writes a little later, “stands on the frontier between wilderness and settlement, between the animal and the human world”. Speaking to Pattanaik on the phone, I tell him that on reading this sort of analysis – and there is plenty else like it in his books – I think of him as a version of the literary or film critic who offers subtextual interpretations and new ways of looking. He chuckles softly, doesn’t say what he thinks of the comparison (later I will have reason to reflect that he probably didn’t approve), but affirms the importance of subjectivity and open-mindedness. The “my” in the title of the new book is essential, as it was in his earlier My Gita. “When you deny the possessive pronoun, you are propagating the idea that your view is the single, objective one. But in the same way that we might read the same poetry and see different things in it – or get different things out of Shakespeare’s plays – we can respond differently to myths too. 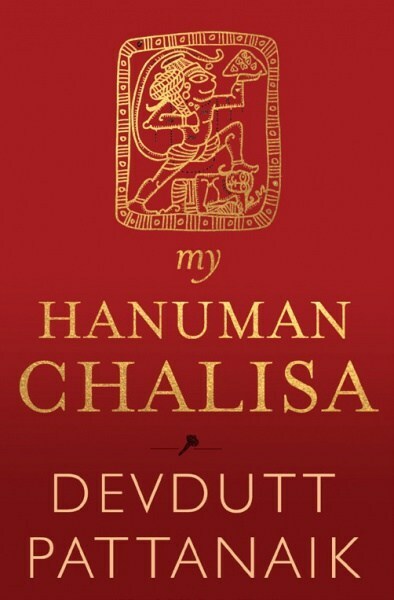 There are so many diverse ways of looking at the same things.” In his Introduction to My Hanuman Chalisa, he states that he isn’t interested in locating a definitive truth but in “expanding ‘my’ truth and the truth of my readers”. These are running themes of his prolific career as a writer and lecturer: that Indian myths are so fluid, wide-ranging and ambiguous that they can confuse or daunt even devout readers, who don’t always know how to make sense of them; that because Hinduism, compared to the other major faiths, doesn’t have a single canonical or prescriptive text, it is often decried by those who hanker after certainties. 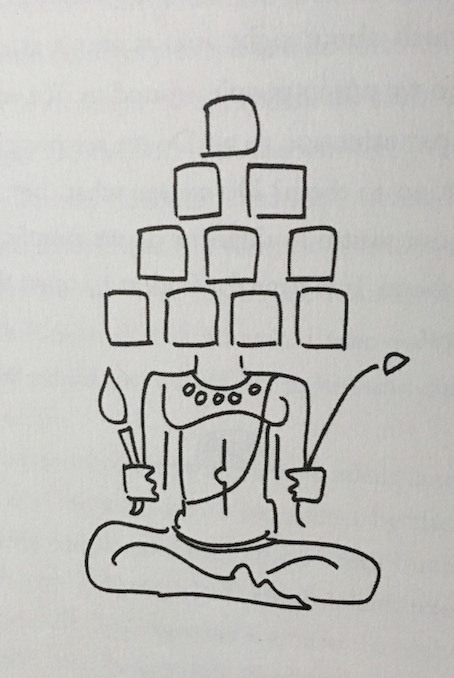 This is where Pattanaik sees himself coming in, to “join the dots”. To distill or synthesize myths, make sense of them for modern readers. He has been doing this for over twenty years now, a period that has seen the publication of thirty books and hundreds of articles, all dealing broadly with myths and what they may teach us. The output includes lucid retellings of the epics (Jaya and Sita, about the Mahabharata and Ramayana respectively), examinations of the many legends surrounding a specific deity (99 Thoughts on Ganesha), books for children (Pashu: Animal Tales from Indian Mythology) and guides for management students and entrepreneurs (Business Sutra). Apart from the many Pattanaiks on view in his books, there are also the avatars that show up in television shows, interviews, video-blogs – and of course, on social media, where he often comes up against people who disagree with or attack him. Including the “trolls” to whom he has dedicated My Hanuman Chalisa. It isn’t easy being a moderate – and a very high-profile one – in a field where emotions are easily inflamed, and at a time when the growth of a virulent, chauvinistic Hindutva can lead the softer, more reflective aspects of the religion to become tainted by association. 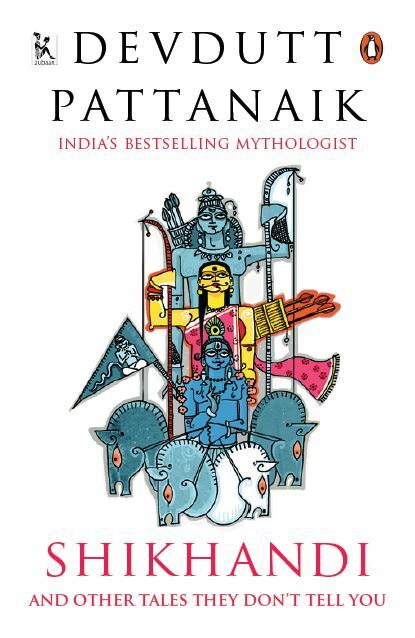 In such a climate, someone like Pattanaik draws fire from both religious literalists – who take offence to the mildest observation that doesn’t chime with their rigid beliefs – and from those secular-liberals who find any close engagement with old texts problematic. To the irreligious mind, some of the things he writes can sound like sophistry, faux-philosophy or even mumbo-jumbo; to a religious Hindu, the very same things can seem inappropriate or upsetting. And so, it isn’t uncommon to see him being assailed, at the same time, as a Hindutva apologist AND as a betrayer of sacrosanct texts. “The Ramayana is the Ramayana – it doesn’t change” someone scolds him on Twitter when he mentions that there are many versions of the epic apart from the mainstream one favoured by the Hindi-speaking belt. When he posts a tweet that goes “Did Ram live 7000 years ago and Krishna live 5000 years ago? No way to verify it”, there are angry comments about “scientific dating” through the Ram Setu bridge. It does seem, though – and this could be my own bias at work now – that Pattanaik finds it easier to sympathize with and engage with the religious mind than the non-religious one; that he is more willing to hit out at the “secularists”, the “atheist fundamentalists” as he sees them, than at religious hardliners. But if liberals can be described as fundamentalist, it is just as possible for a mythologist – even a moderate one – to become inflexible. Beneath the soft-spoken, genial man who values subjectivity and discussion – and prefaces much of what he writes with a humble-sounding epigraph about how the Gods may have a thousand or a hundred eyes, but “you and I, only two” – there may be another, more complex Pattanaik: someone who is very conscious of his reputation as a guru, and can get riled when his definitions are questioned. “Myth = somebody's truth,” he writes in a tweet. “Fiction = nobody's truth.” But isn’t this a very limited view of what good fiction – or literature – can be? Any such writing – regardless of genre or the many other labels critics stick on literature – can contain deep poetic truths and can teach us a great deal about people and their lives. When I suggest that the line between myth and fiction may not be so clear, the conversation takes a southward turn and Pattanaik loses his composure, accuses me of disrespecting the dearly held beliefs of others by calling them “just fiction”, and wonders if I would tell my grandmother that her Krishna murtis were like Barbie dolls. Notably, he frames the concept of disrespect in a way that is common among those who believe religious sentiments are automatically more important and respect-worthy than any other sort; in such a framing, non-believers are better off keeping their mouths shut all the time! But Pattanaik may be doing religious people (especially those within a traditionally open-ended faith like Hinduism) a disservice by treating them as a homogenous group of infants whose feelings must never be hurt, nor their views challenged – and as being incapable of having nuanced conversations about faith and lack of faith. He apologizes subsequently for having lost his cool, soon returns to his usual gracious, soft-spoken self – but just for a few minutes it was as if a Ravana had lost one of his heads. Since you champion subjectivity, I ask him, why are those readings any less valid than the benevolent, comforting ones? Why would the perspective of a marginalized, underprivileged character not be just as important? There is a sliver of truth in this. The use of a purely political or ideological lens to look at creative works – at the cost of closely engaging with the human complexities in those works – is a familiar one, and it often tars literary and film criticism too. Personally, I have plenty of experience of people who, without having closely read the Ramayana, will reflexively make sweeping statements about Rama being a bad husband (in much the same way that rigidly religious people will refuse to see Rama as anything other than a God whose actions mustn’t be questioned). However, it is problematic to say that privilege and under-privilege are just political terms – they are real things and take many forms, including more complex, intersecting, context-dependent ones than caste or gender inequality. To take one instance, the mighty Pandava prince Bhima would not be deemed unprivileged in any conventional sense of the word – yet, in MT Vasudevan Nair’s excellent Randaamoozham, Bhima – the narrator-protagonist – is decidedly the underdog, forever in the shadows of his siblings Arjuna and Yudhisthira. He sees himself as hard done by, and this is necessarily the lens through which the whole of that book unfolds; it would be silly to expect the author to provide a “balanced” viewpoint. And yes, there is something either disingenuous or deluded about any position that goes: “Other people have agendas. I do not.” To some degree or other, everyone has biases, born of countless unquantifiable life experiences. The impulse to be seen as an authority figure, a conduit who provides wisdom, can be a sort of agenda too – a non-malicious one, but one that might grow over time as you become a bestselling author and protective of your own image. "“The Ramayana is the Ramayana – it doesn’t change” someone scolds him on Twitter when he mentions that there are many versions of the epic apart from the mainstream one favoured by the Hindi-speaking belt"
There is a source text. And that is Valmiki Ramayana. Sure, there may be any number of variations. But the source of the tradition has to be acknowledged instead of just saying - "oh there are so many ramayanas". And contrary to what many people think, the newer versions of Ramayana are more straitlaced (nothing wrong with that, but liberals do have a problem with that attribute), than Valmiki Ramayana. Kamba Ramayana (the standard Tamil version) is a lot more conservative than Valmiki Ramayana. So is Tulsi's Ramcharitmanas in some ways. But then, these newer versions are also more "progressive" than Valmiki's in ways that are not often acknowledged. For eg - In Valmiki Ramayana Rama indeed asks Sita to undertake Agni-Pariksha to prove her chastity. In Tulsi's Ramayan, he creates this concept of "Maya Sita" to make Rama's decision more palatable to the "progressives" of his day, who would otherwise have not liked Rama for his decision. instead of just saying - "oh there are so many ramayanas"
Shrikanth: before you post dozens more comments, let me caution you that you're already in straw-man territory. No one - least of all a prolific, verbose mythologist like DP - "just says, oh there are so many Ramayanas". There is plenty of explanation, analysis and contextualising that goes with it. "The ISIS and RSS, he says, very perplexingly, “are engendered by atheists and secularists who deny the role of the sacred and the transcendental in the world"
It's quite laughable to mention ISIS and RSS in the same sentence. I wonder what kind of a mind manages to do that. The only similarity I see is that both acronyms have two S's. Okay. Accepted (with a few reservations). But would you agree that the disproportion is much greater when comparing people like Dawkins and Hitchens (or Charlie Hebdo) with religious extremists of any stripe? "Since you champion subjectivity, I ask him, why are those readings any less valid than the benevolent, comforting ones? Why would the perspective of a marginalized, underprivileged character not be just as important? " Well. For one thing, Ramayana and Mahabharata have the status of "Itihaasa" in the tradition. Sure, that doesn't make them "histories" in the strict sense. But even historians acknowledge that they atleast partly recall actual events. And that the source text is the one closest to the society / events described. For eg : If I have to know more about the society / milieu of Ramayana, I would read Valmiki! Not Kamban. Not Tulsi! Not Chakbast. Not RK Narayan. Not CR. For that reason atleast, the source text is indeed "more important" than successive retellings, which for one thing are not original. And secondly, are very remote from the original milieu of the legend / myth / history. Secondly the standard source text is indeed more "catholic" in its orientation, more accommodating of diverse viewpoints, than later renditions which always have a certain narrative. For eg : The Tamil version of Ramayana (Kamban's) written in 12th century is very very brahminical. Contrary to a lot of north indians who associate brahminism with north india. The Kamban version is also the first truly theistic Ramayana (far more theistic than Valmiki's). Tulsi's Ramayana is also a very theistic Ramayana. And yes, in our own times, we have these subaltern renderings which take up the cause of marginalized characters and groups like women and Dalits. This makes these renderings very narrow and less catholic. In sharp contrast, Valmiki Ramayana (being the source text) is least afflicted by any of these narratives! It is indeed the most balanced, and the most dispassionate of all major Ramayana versions. Partly because the poet is remembering facts (part-fact, part-legend) ofcourse with his memory and not embellishing it greatly with his own spin! For instance Valmiki Ramayana presents all the viewpoints quite fairly and the reader can make up his own mind, unlike Kamban or Tulsi or the subaltern versions of today, which carry their own baggage. Another reason why we should indeed value the source text more highly than we do! And stop valorising these umpteen versions. I value originals. It's not that hard to read by the way. Valmiki Ramayana is available online. And is an easy read. "Okay. Accepted (with a few reservations). But would you agree that the disproportion is much greater when comparing people like Dawkins and Hitchens (or Charlie Hebdo) with religious extremists of any stripe?" Sure. Agree. No fan of Hitchens or Dawkins or Danish cartoonists. But I do agree wholeheartedly the disproportion is greater in this example. "Shrikanth: before you post dozens more comments, let me caution you that you're already in straw-man territory. No one - least of all a prolific, verbose mythologist like DP - "just says, oh there are so many Ramayanas". There is plenty of explanation, analysis and contextualising that goes with it." Sure. But let's spend more time analyzing the "original"! It is well worth it. It's an original work for one thing and not merely a retelling. That in itself should greatly increase the interest in it. Srimad Valmiki Ramayanam is in my view the greatest work of literature to ever come out of India. The most influential book ever written in this land over the past 3000 years. Another point to note - The two kaandas that are most problematic to liberals of today are "Baala Kaanda" which is explicitly theistic and "Uttara Kanda" which has the narrative of Rama banishing Sita when she's pregnant fearing a Dhobi's rumour. Nearly all scholars today agree that both Bala Kaanda and Uttara Kaanda are later additions to the epic and the original Epic actually began with Ayodhya Kaanda and ended with the coronation of Rama! So you see.....going back to the source text (the earliest layer of it) alone will remove a lot of the uneasiness people have with this great epic! a) Rama curses Dasaratha and Keikeyi and even wishes he could kill them in the early days of his banishment! b) In the Sundara Kaanda, Hanuman tells Sita that "O Sita, Rama has stopped eating meat ever since you left him out of sorrow". Amazing! Stuff that Tulsi or Kamban would never have written because they were more brahminical in their orientation. ANd hence couldnt ascribe stuff like hate, spite or meat-eating to a God. Valmiki's Rama is a man! Full of faults and foibles. ANd yet, Great! No doubt about that. First among equals. A Purushottama. "Personally, I have plenty of experience of people who, without having closely read the Ramayana, will reflexively make sweeping statements about Rama being a bad husband "
Actually Rama is remarkably "progressive" for his time. The Ramayana text dates roughly to 300-400 BCE. That makes Valmiki a contemporary of Plato or Socrates. Now in Ancient Greece, at the time, women were not much better than slaves. And the idea of one man having just one wife and being devoted to her was bizarre! Plato himself finds the idea of romantic love very silly! Rama's monogamy was very very atypical for his time. And this man (i.e character) has done more for the cause of monogamy than anyone else in Indian history. In all of western literature, it is hard to find the kind of romantic love seen in Ramayana until Shakespeare came along with his Romeo and Juliet. Now Romeo and Juliet was a revolutionary work that changed conceptions of sexual love in the West. It is atleast some 2000 years younger than Valmiki Ramayana. That's how far ahead Valmiki was of his time.